Go head to head with the experts! For the first time, you can check your wits against more than 40 world class experts like feminist Gloria Steinem, Bill Nye the Science Guy and Steve Young, former 49ers quarterback. This game features hot shots in all kinds of fields. 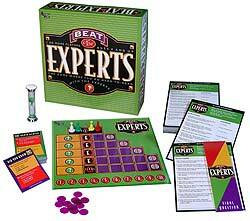 Each expert is asked a set of 10 questions in his/her general area of expertise. You try to get more right answers than the expert. Itâ€™s that simple! But youâ€™ve still got a shot. Because, you see, while astronaut Buzz Aldrin may know which planet is light enough to float in water, he may not know which band Keith Moon played drums for.